Saint Julian Press, Inc., 9780998640419, 112pp. "The poems of Elaine Fletcher Chapman are meditations waiting for our eyes to open. A few of these poems remind me of the beautiful seashells one finds on the beach after a storm. Chapman writes from the heart reminding us to discover the strength to love. There is loss as well as celebration in Hunger for Salt. Here are poems Thomas Merton would tuck somewhere inside his robes. Here is the Chapman rosary for our days to come." 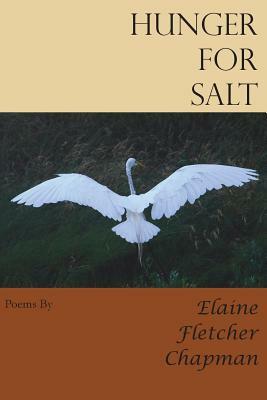 "In Elaine Fletcher Chapman's Hunger for Salt, the hunger is palpable: for the natural world, the spiritual world, and the realm of the carnal. These powerful, well-crafted poems invite the reader into the place where these worlds meet. There is an intimacy here missing from much contemporary poetry, and intimacy is what drew me in until my hunger, like salt, dissolved." "Hunger for Salt is a tender evocation of the natural world. Chapman displays a poet's sensibility, a quiet attentiveness to personal wonder, intimacy and grief. The stillness of these poems exposes the refractive quality of memory and desire; it is a poignant and elegant debut."